The US House of Representatives has narrowly voted to pass a landmark healthcare reform bill at the heart of President Barack Obama's agenda. The bill was passed by 219 votes to 212, with no Republican backing, after hours of fierce argument and debate. It extends coverage to 32 million more Americans, and marks the biggest change to the US healthcare system in decades. 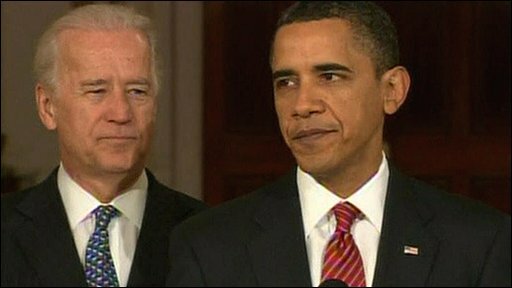 "We proved that we are still a people capable of doing big things," Mr Obama said in remarks after the vote. "This legislation will not fix everything that ails our healthcare system, but it moves us decisively in the right direction," he said. Mr Obama is expected to sign the legislation into law shortly. But a new challenge is expected in the Senate, where Democrats hope amendments to the bill will be enacted by a simple majority. Republicans say the move is unconstitutional and plan to stop it. This is the most significant victory for the president since he took office 14 months ago, says BBC North America editor Mark Mardell. Mr Obama has been tough and tenacious - some might say stubborn - in pushing this legislation after so much opposition and so many setbacks, our editor says. When the vote count hit the magic number of 216 - the minimum needed to pass the bill - Democrats hugged and cheered in celebration and chanted: "Yes, we can!" Under the legislation, health insurance will be extended to nearly all Americans, new taxes will be imposed on the wealthy, and restrictive insurance practices such as refusing to cover people with pre-existing medical conditions will be outlawed. However, our editor says healthcare reform has become a rallying point for Republicans, who are convinced the American people do not want the changes and that it will be a vote winner for them come the mid-term elections in November. They say the measures are unaffordable and represent a government takeover of the health industry. While many Americans seem to genuinely yearn for the cross-party accord they call bipartisanship, and politicians at least play it pious lip service, this lengthy debate has revealed a gaping ideological chasm. President Obama identified overhauling the healthcare system as his priority and he's got what he wanted, a victory that eluded Teddy Roosevelt, Richard Nixon and Bill Clinton. But when he threw down the gauntlet the conservatives eagerly picked it up. Healthcare didn't create the tea party movement but it gave it a focus and a cause. There are dangers to his left as well as his right. He's harmed his reputation with his own power base, for many liberals feel there have been so many compromises the bill is hardly worth it. 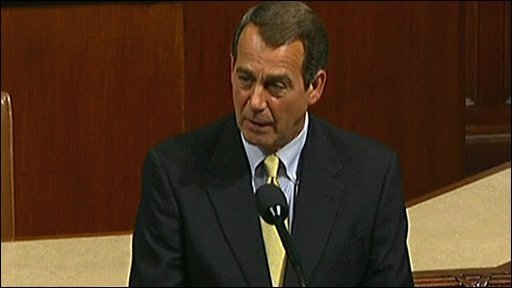 "We have failed to listen to America," said Republican party leader John Boehner. Speaking moments before the vote, House Speaker Nancy Pelosi said the healthcare reform honoured the nation's traditions. "We will be joining those who established Social Security, Medicare and now, tonight, healthcare for all Americans," she said, referring to the government's pension programme and health insurance for the elderly, established nearly 50 years ago. Although Democrats pushed the measure through with three votes to spare, 34 members joined Republicans in voting against the bill, worried about paying a political price in November's elections. In a last-minute move designed to win the support of a bloc of anti-abortion lawmakers, Mr Obama earlier on Sunday announced plans to issue an executive order assuring that healthcare reform will not change the restrictions barring federal money for abortion. The BBC's Mark Mardell says Sunday's vote was a pivotal moment, but it is not clear which way the balance will swing in the mid-term vote. The first opinion polls will make fascinating reading, he adds. The bill's final approval represented a stunning turnaround from January, when it was considered dead after Democrats lost their 60-seat majority in the Senate, which is required to defeat a filibuster, a method used to delay or block the passage of legislation. To avoid a second Senate vote, the House also approved on Sunday evening a package of reconciliation "fixes" - agreed beforehand between House and Senate Democrats and the White House - amending the bill that senators adopted in December. The president is expected to sign the House-approved Senate bill as early as Tuesday, after which it will be officially enacted into law. However, the bill will contain some very unpopular measures that Democratic senators have agreed to amend. The Senate will be able to make the required changes in a separate bill using a procedure known as reconciliation, which allows budget provisions to be approved with 51 votes - rather than the 60 needed to overcome blocking tactics. The Republicans say they will seek to repeal the measure, challenge its constitutionality and co-ordinate efforts in state legislatures to block its implementation. But the president has signalled he will fight back. The White House plans to launch a campaign this week to persuade sceptical Americans that the reforms offer immediate benefits to them and represent the most significant effort to reduce the federal deficit since the 1990s. "This only worked well for the Republican Party if it failed to pass," David Axelrod, one of Mr Obama's closest political advisers, told the New York Times after Sunday's vote. "They wanted to run against a caricature of it rather than the real bill. Now let them tell a child with a pre-existing condition: 'We don't think you should be covered.'" According to the Congressional Budget Office, the healthcare bill will cut the federal deficit by $138bn (£92bn) over 10 years. The non-partisan body said last week that the legislation would cost about $940bn (£626bn) over the same period. The reforms will increase insurance coverage through tax credits for the middle class and an expansion of Medicaid for the poor. They represent the biggest change in the US healthcare system since the creation in the 1960s of Medicare, the government-run scheme for those aged 65 or over. Healthcare reform is a priority for Barack Obama. The US spends about $2.2tn a year on its system - which includes private, federal or employer schemes. US expenditure on healthcare is the equivalent of about 16.2% of GDP - nearly twice that of some other OECD countries. The US falls behind some OECD countries for life expectancy and has a higher rate of infant mortality. Almost 46m US citizens do not have health insurance.